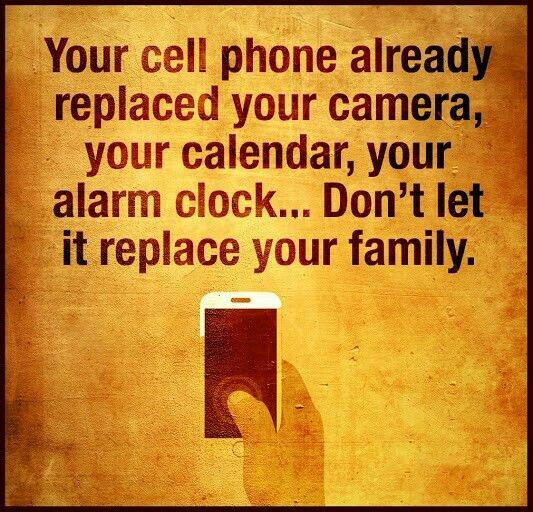 Don’t let your phone replace your family. It’s time to Recharge your relationships by unplugging from your phone. A few decades ago, a person seemed somewhat incomplete without his favorite book, a pen, a wallet, Walkman, iPod or even a game-boy. Each had a different obsession, some fascinating and some mysterious. But today, there is only one delight to possess ..Cell Phone! Of course, the good thing of having a Cell phone means that you don’t need to carry a book, game-boy, camera or an iPod separately as it’s the all-in-one, but downside is that it has taken over the lives in a way that young kids are seen fighting with parents to buy them the branded ones every time new versions are launched and parents on the other hand, instead of spending time with the family, seem lost and aging with it. Cell phones first invented as a gadget to be able to connect in emergency, has now become the most preferred companion of many, so much so that it has officially become a new body part …the fifth limb! While I can’t completely criticize the advent of the cell phone, but silently and sadly, I definitely miss certain things. Little did I realize, in the beginning of a new semester when everyone is busy accepting new friend requests on Facebook after a brief acquaintance, that instead of having my first conversation in person, it all starts and ends up in a chatroom! Whenever friends gather on weekends after a detailed planning, it starts off noisy in the beginning but after exchanging a few glances and smiles, it gets quieter and quieter until everyone gets down checking their Facebook and WhatsApp accounts. Also in classroom, after having chatted all night, one realizes there is not much to share with the friend sitting next to you, although you worked hard to reserve that special seat. More importantly, what is becoming increasingly common is online confessions( call them proposals but I still think that word belongs to the matrimonial dictionary). Cell phone has become the perfect device of the strangers, to use it to their advantage and surprise the hell out of their fantasy partners with unimaginable stalking. Being an avid reader of novels, and having romanced for so long the idea of true confessions from my first prince in ink and paper, I have painfully come to realize that it was all my unrealistic expectations. Gone are the days of witty repartee and emotional afflictions, instead all we get at best is a “LOL” or even better a message saying “I HEART YOU” with some flowers and kisses next to it. Actions and emotions are all unknowingly downplayed in this tech savvy age. Some are especially emboldened by this new advancement as they are no longer misinformed or missing in any way and for once, are able to make up for it and compete on an equal level in their insane quest to impress others. An avid fan of Pride And Prejudice, Belle and all those other regency era movies, I marvel how every word they say in their sentences(however long) is gloriously weighted. Forget about using such adept words and structured sentences, people don’t even complete them anymore. Texting, messaging, and using emoticons seem to be the rule. I still feel a flutter or two in my heart and contentment in my stomach after reading books with such long and wittingly crafted sentences.Being a traditionalist, who goes around with at least three books stashed in a companionable rucksack, I find myself part of a dying breed. There could be others, as I understand, feeling left out, for not updating Facebook with selfies or participating in WhatsApp chats. There are several reasons compelling people to become cell phone addicts, either it is loneliness and boredom in the elderly, a temporary nanny to the toddlers (providing relief to tired moms),peer pressure in the teenagers or past-time lurking in the working class. Whatever be the reason, Cell phone has become an intrusion into one’s privacy and in spite of being connected to thousands of friends, people still complain of loneliness and depression. Before you embrace and welcome the Fifth Limb into your life, think again if your privacy, self-worth and relationships are at stake?